One is from the High Park area in the west end of Toronto; the other is from Pickering, the first community east of Metro Toronto. One just turned 23; the other won’t turn 21 until June. One is a late-blooming 6-foot-5 goalie who may be closer to 6-foot-6, with the size, confidence, calm demeanor and puck-stopping ability that has NHL teams falling all over themselves to sign him as an unrestricted free agent; the other is a 5-foot-10 goal-scoring left winger who may be closer to 5-foot-9, with an edgy, chip-on-his-shoulder mentality and high skill level that is perhaps, finally, causing some NHL teams to at least consider the notion the unrestricted free agent can be successful in pro hockey in spite of his size, or lack thereof. For all their differences, though, there is much Matt O’Connor and Drake Caggiula share: two Canadians, both products of the Greater Toronto Area, who have taken the hockey path less travelled to play pivotal roles for their respective U.S. college teams in a head-to-head match-up against each other a week this Thursday, in the semifinal of the 2015 NCAA Frozen Four at Boston’s TD Garden. One is a junior who wears the red and white of Boston University in Hockey East; the other is also a junior but in the green, black and white of the University of North Dakota in the National Collegiate Hockey Conference. One will win; one will lose; which means only one is guaranteed to play for a U.S. college hockey national championship a week this Saturday in Boston. Which one moves on, and what happens to O’Connor and Caggiula beyond that? Well, that’s why they play the games. It wasn’t so much that Matt O’Connor was opposed to the idea of playing in the Ontario Hockey League as it just didn’t seem like it was in the cards. As a 15 year old in the 2007-08 season, the big goalie played for the vaunted Toronto Marlboros minor midgets. His teammates that season included future pros Christian Thomas and Freddie Hamilton, who were selected in the first round of the OHL draft, and J.P. Anderson, his netminding partner who was an OHL second-rounder, as well as defenceman Adam Clendening, an OHL fifth-rounder. O’Connor’s name was never called in the OHL draft, and he was fine with that. He wasn’t from what you would call a traditional hockey family. His Dad Kevin, president of an e-learning health and safety business as well as a green business consultant and entrepreneur, was a competitive rower who runs marathons. His Mom Lesley quit her job to become a yoga teacher and take culinary nutrition courses and focus on health and wellness interests. His older sister Katie was a competitive rower at the University of Western Ontario. Education was always important to O’Connor. If the OHL wasn’t to be, it wasn’t to be. He attended prestigious Upper Canada College in Toronto and focused on his studies. He still was devoted to hockey, though, playing the better part of two seasons for the UCC-affiliated Ontario Junior Hockey League (Jr. A) Patriots. He still yearned to play at a higher level. Late in his second OJHL season, he was traded at the deadline to the Burlington Cougars, who with Josh Jooris (Union College and a member of the Calgary Flames) and Greg Carey (St. Lawrence University and signed as a free agent by the Arizona Coyotes) provided more exposure to potential student-athlete opportunities. "I was interested in D1 (U.S. college), D3 (U.S. college), anywhere really," O’Connor said of his quest. "I was really drawn to the Ivy League schools, I would email them, but I couldn’t get a full offer. I was applying to Canadian universities, I looked at Amherst College (D3). I was wide open to any of them." Finally, after his second OJHL season, at age 18, O’Connor decided if it was his goal to play U.S. college hockey, he had better go south to the U.S. to make himself a more known commodity. He went to a United States Hockey League (USHL) tryout camp in Youngstown, Ohio. "It was awesome," O’Connor said. "There were 11 D1 scouts at the camp, which is what I was after. But it was nerve wracking, too. There were 50 goalies there and they kept cutting it down until there were only two left and I was one of them. That’s what really kick-started things for me." O’Connor soon had full U.S. college scholarship offers to consider. Merrimack was the first; not long after that Boston University. Once he went to BU on his official visit, he was sold. O’Connor played two seasons with Youngstown in the USHL and entered BU as a 20-year-old freshman. "I was just a late bloomer," O’Connor said. "Going from the GTHL (Greater Toronto Hockey League) to the OHL is a sprint, which is fine, but not if you’re not ready for it and I wasn’t. I grew a little bit later, I matured later, I got my confidence later." O’Connor did get a cursory and fleeting look from the NHL along the way. It was during his second OJHL season with the Patriots that, in his first year eligible for the NHL draft, Central Scouting put his name on a mid-season Players to Watch list, identifying him as a low-level C prospect. Of course, nothing ever came of it. His name was never called in three consecutive NHL drafts. BU head coach David Quinn first saw O’Connor during the goalie’s freshman year with the Terriers, but Quinn was on the Colorado Avalanche coaching staff at the time. "The (NHL) lockout was on and I was watching a lot of college hockey and I saw this big goalie with size, athleticism and poise and I knew right then he had all the tools," Quinn said. A year later, Quinn had left the Avs to return to his alma mater as head coach when the legendary Jack Parker retired. As head coach, Quinn watched O’Connor battle for playing time with battery mate Sean Maguire (Pittsburgh’s fourth round pick in 2012), saw him continue to develop but also hit some bumps in the road in what was a really tough BU season (ninth-place finish in the 11-team Hockey East). This season, O’Connor’s junior year, he took over as the undisputed No. 1 when Maguire took a medical red shirt year. Both O’Connor and the Terriers fully blossomed this season. Freshman sensation Jack Eichel led the way up front; O’Conner shut the door in the crease. While NHL scouts flocked to see Eichel, a generational talent ranked second only to Connor McDavid, the reviews on the NHL free-agent goalie were also rave. It wasn’t long before O’Connor was tabbed as the premier UFA in U.S. college hockey, not that he necessarily snuck up on anybody. O’Connor has been to five NHL team summer development camps, two with Chicago (2013 and 2014) and one each with Ottawa (2011), New York Rangers (2014) and Vancouver (2014). The next time he shows up to an NHL camp it will almost certainly be with a contract in his pocket. "He’s as mature a 23-year-old as I’ve ever seen," Quinn said. 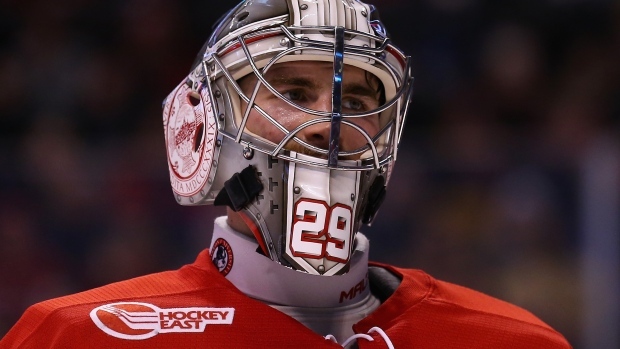 "Everything he does is to prepare himself to be (a professional goalie). Everything has a purpose. What he eats. How he trains. He just keeps getting better and better." This is quite likely O’Connor’s final college season. He’s eligible to return next season for his senior year. He said he’s made no decisions yet; his focus is entirely on the ice and leading the Terriers to a national championship. O’Connor is letting his family advisor Todd Reynolds of Uptown Sports deal with the considerable NHL interest. Most of the teams have called to express interest. Edmonton, Ottawa, Buffalo, the Rangers, Vancouver, Calgary and Philadelphia are believed to be amongst the most interested clubs with a chance to land him. Once his season ends, whether it’s a week Thursday or a week Saturday, it’s likely he’ll visit the NHL teams he’s serious about signing with. "(NHL) teams have been respectful of me just playing and letting Todd handle the other stuff," O’Connor said. "If this does turn out to be my last (season) at BU, it’s been memorable. We’ve put up two banners (Beanpot champions and Hockey East champions) playing at the (TD) Garden this season and my only focus now is getting the third." Drake Caggiula (pronounced KA-jewel-uh) is a rare bird. It’s highly unusual, almost unprecedented to be honest, for a Toronto-area kid to go to the University of North Dakota at all, never mind to go as an 18-year-old freshman, as Caggiula was when he arrived in Grand Forks in 2012. Many Canadian players seeking scholarships favor NoDak – by any name, it’s a perennial college power with impressive alumni and arguably the best facilities in U.S. college hockey – but it’s always had a stronger connection with those on the Canadian prairies and western Canada than Toronto. North Dakota’s most prestigious alum, Chicago Blackhawk captain Jonathan Toews, unwittingly played a role in inspiring a 12-year-old Caggiula, who was glued to the television in his Pickering home watching the 2007 World Junior Championship. That was when Toews and netminder Carey Price led Team Canada to a dramatic semi-final shootout win over Team USA. Caggiula was so captivated by Toews’ performance that day and only knew Toews had a different background than most of the other junior players on Team Canada. He needed to know more. "I did some research," Caggiula said. "I knew (Toews) didn’t play (in the Canadian Hockey League) but I didn’t know anything about the school he was at. That’s when I first heard about (North Dakota)." Three years later, Caggiula was a prolific but undersized 15-year-old on the Ajax-Pickering minor midget team. It was his OHL draft year and while he was attracting considerable interest from scouts in spite of his physical stature, his minor midget team made a road trip to Kalamazoo, Mich., to attend a Western Michigan University game. It was his first exposure to the U.S. college game. He loved it. "We sat in the student section and it’s one of the best student sections in college hockey," Caggiula said. "The atmosphere was awesome. I remember going home with my Dad (Sal) and saying to him, ‘It might be cool to play college hockey.’ That’s the first time I really thought about it." He thought about it again after the OHL draft that summer. Caggiula was taken by the Erie Otters in the third round. With 56 goals, 95 points and 140 penalty minutes in 66 minor midget games for Ajax-Pickering, Caggiula had hoped he would go higher than the third round. At a shade over 5-foot-7 pounds and not quite 150 pounds, he wasn’t overly confident he could play in the OHL or would get a good enough chance to prove it. Otters’ general manager Sherry Bassin did his best to convince Caggiula otherwise, but it was not to be. The player played his 16-year-old season with Stouffville of the OJHL. Bassin took another serious run at convincing Caggiula to sign that summer but the player remained adamant, so much so that he wanted to play the next season at Des Moines of the USHL. Once Bassin, who himself went to the University of North Dakota, realized Caggiula wasn’t reporting to Erie, the Otters’ owner and GM actually called the coaching staff at NoDak to tip them off about Caggiula going to Des Moines. 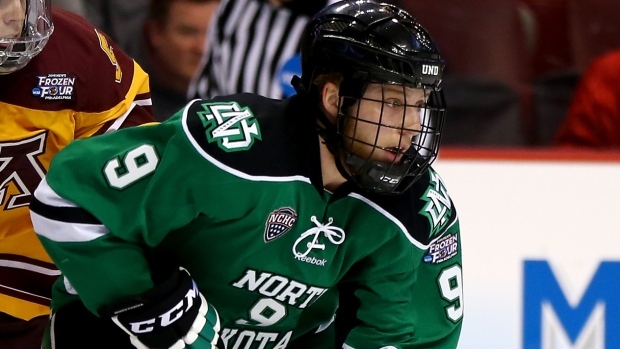 "That’s where we first saw him," North Dakota head coach Dave Hakstol said. "We saw his first (pre-season) game in Des Moines and we followed up after that." "Following up" led to a scholarship offer, which Caggiula eagerly accepted. He didn’t last long in Des Moines – "it just wasn’t a good fit," Caggiula said – so he returned to finish the season with a strong Stouffville OJHL team. A year later, he reported to Grand Forks as an 18-year-old freshman, where in the last three seasons the diminutive winger has emerged as North Dakota’s top offensive threat. He leads the team in both goals (18) and points (36) in 41 games this season. Many of his goals are of the highlight reel variety. In spite of his size – barely 5-foot-10 and 180 pounds – Caggiula plays a hard game, looks for big hits and plays with a hard-edged focus that is the by-product of a lifetime of being told he’s too small to make the next level. "That’s what fuels my fire," he said. "I know what they say about me, ‘good college player, not big enough to do it (in the NHL).’ It motivates me, for sure." Caggiula finally got some NHL love last summer when the Buffalo Sabres invited him to their summer development camp. If nothing else, it convinced him he can compete with players who are bigger and/or drafted by an NHL team. "There’s no doubt in my mind," Caggiula said. "I can do this." But he’s working to his own timetable. While pro interest may be slowly escalating, Caggiula said he’s "always envisioned himself as a four-year player" and it sounds like he’ll be back for his senior year next season. "He’ll play a game in the NHL, there’s no doubt of that in my mind," Hakstol added. "When it happens or what he does with it once he gets there, that will be up to him. He’ll have to prove he can handle the step up in pace. NHL players are so big but they’re also so fast. I think he can do it. Drake is not big but he’s hockey strong. He competes hard, too hard sometimes. He hits with a purpose, loves to really hit people, but he’s a veteran and we need him to be scoring goals. He plays the game hard. He plays the 200-foot game. You can tell he’s a coach’s son, he gets it." Caggiula’s Dad Sal coached him throughout his minor hockey career, except for his OHL draft year, when he stepped aside to give his son some space. Even now, Sal Caggiula is back coaching the Ajax-Pickering minor midgets. "Drake is a throwback," Hakstol added. "He’s a very direct young man, both on and off the ice. His demeanor is the same on the ice as off it. Focused. He’s like a pit bull. He’s a hard kid to bet against." Matt O’Connor and Drake Caggiula aren’t the only Canadians participating in the NCAA Frozen Four, far from it, and their stories aren’t necessarily unique in terms of the quest to overcome obstacles to forge a professional career. That’s a universal theme for anyone wearing skates. And you don’t have to look too far to find a player who combines elements of both their stories. BU winger Evan Rodrigues, who scored two goals including a beautiful toe drag, game-winning snipe to lead the Terriers over Minnesota-Duluth on Saturday night and a berth in the Frozen Four, hails from Etobicoke in Toronto. A year younger than O’Connor and a year older than Caggiula, Rodrigues is a graduating senior who followed his heart to U.S. college hockey four years ago rather than play in the OHL (where he was drafted by the Ottawa 67s). NHL scouts are trying to get a read on whether the 5-foot-11, 180 pound winger can score clutch goals in the pro game the way Rodrigues has been doing it in his final college season. Coach Quinn’s phone has been ringing with inquiries. In any case, the story lines are set for the Frozen Four: Providence College vs. University of Nebraska-Omaha in one semi-final on April 9; O’Connor’s Boston University vs. Caggiula’s University of North Dakota in the other later that night in the home of the Boston Bruins. It’s not the first time O’Connor and Caggiula have gone head to head. There were a couple of USHL games in 2011; but more recently, in late November of last season, a 3-1 BU home-ice win over NoDak and a 3-3 overtime time, where O’Connor’s 55 saves were the difference in the game. Caggiula was held pointless in each. This time, though, the stage is bigger and brighter. One of the Toronto-area kids will win; one will lose; one will be in a national championship game; but both will continue to try to make their way in hockey on a path less travelled.